In the past decade, with the trend of ‘organ transplant tourism,’ many instances of unbelievably efficient transplant surgeries have appeared in the press. One doctor performed 246 liver transplants in one year. A patient received two kidney transplants within 48 hours…International medical experts have doubts about China’s huge organ sources: as a routine surgery, organ transplantation itself is not difficult; the difficult part is mainly matching and searching for organs. When the international community requires years of waiting to find a matching liver or kidney, why does the ‘searching miracle’ only happen frequently in China? In case of failure, [we will] continue to perform transplants until one is successful, and will not charge for the repeat surgeries. In countries with advanced healthcare capabilities and well-organized organ donation systems, patients usually wait many months or years for a donor organ to become available.4 5 Yet, in China, where organ donation is culturally taboo and there is not yet an effective organ donation system, patients can find matching organs whenever needed, suggesting that there is a large number of readily available organ sources waiting to be matched to patients. Shanghai Changzheng Hospital’s organ transplant department stated on its application form for liver transplants in 2006 that the average waiting time for liver transplantation was one week7 and that the shortest waiting time was 4 hours.8 Between 2003 and 2006, the hospital performed 120 emergency liver transplants for patients requiring a transplant operation within 72 hours. Outside of China, finding donor organs for such emergency transplants is nearly impossible. According to the China Liver Transplant Registry’s 2006 Annual Report, among 8,486 liver transplants were performed in 29 facilities in China with 4,331 classified as either emergent or elective. Emergency transplants comprised 1,150 (26.6%) of classified cases.9 Wait times for non-emergency liver transplants were usually quoted in weeks. In Mainland China, it is not unusual for doctors to procure multiple organs for use as spares or to perform multiple transplant operations due to rejection, both in quick succession, on the same patient10. These cases have even included third and fourth transplants. On one occasion, eight pairs of kidneys were procured for the same patient. The hospitals surveyed performed a wide variety of transplants: kidney, liver, heart, lung, spleen, adrenal glands, pancreas, combined liver-kidney, combined pancreas-kidney, heart-lung, heart-kidney, small intestine, liver-pancreas-duodenum, pancreas-duodenum-kidney, liver-pancreas, liver-small intestine, pancreas-kidney, parathyroid, thyroid-parathyroid-thymus, abdominal organ cluster, all 7 abdominal organs, and eight large full abdominal organs. The list includes 23 kinds of single-organ and multi-organ transplants, including cornea, bone marrow, testicle, bone, skin (including facial), hair, larynx, and many other types of tissue transplants. Currently, permits from the Ministry of Health are required to conduct six types of solid organ transplants (kidney, liver, heart, lung, pancreas, and small intestine); cell and tissue transplants do not require permits. Yet, the vast majority of institutions have expanded into multiple types of transplants beyond the ones for which they have received permits from the Ministry of Health. For example, Peking University Third Hospital carries out transplants of heart, lung, cornea, stem cell, bone marrow, vascular grafts, and hair, in addition to the types for which they have approval: liver, kidney, pancreas, and small intestine. This hospital performs eleven types in total. 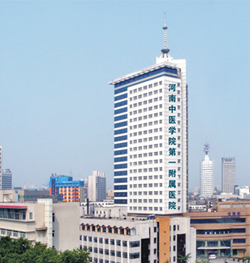 Sun Yat-sen Hospital of Xiamen University has approval to perform only heart transplants, but also performs nine others including: kidney, liver, pancreas, spleen, lung, heart-lung, small intestine, islet cell, corneal, and bone marrow. Wuxi People’s Hospital is approved only for lung transplants but also carries out eight other types: kidney, liver, heart, pancreas, cornea, stem cell, bone marrow, and vascular grafts. 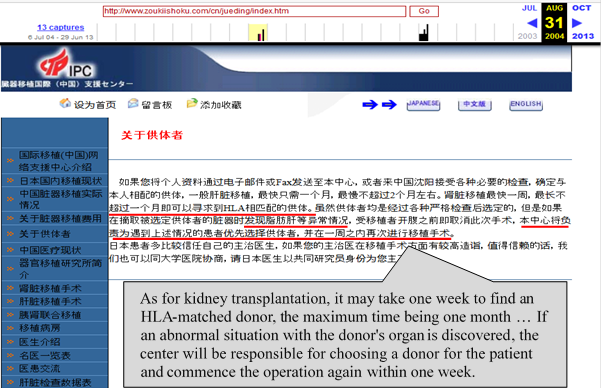 "Beyond the Dark Veil of China’s Organ Trade Source:Phoenix Weekly Dated:September 24, 2013 The original page has been removed from:"
"YunNan Kunming Kidney Disease Hospital – Overview"
"YunNan Kidney Disease Hospital—a branch of the Yunnan Province Organ Transplant Center"
"United States Renal Data System"
"Organ Transplant waiting times rise fast Guardian July 4, 2011"
"The Selection of Volunteers (archived web page). CITNAC. August 29, 2007." 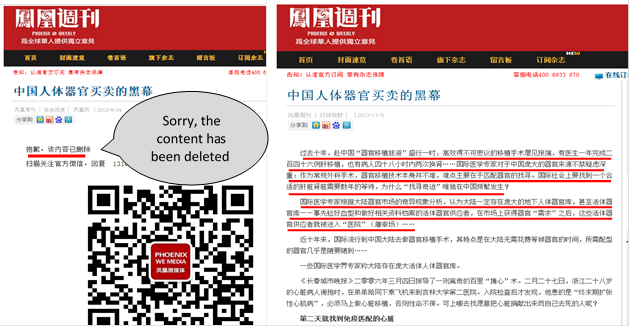 "“Application for Liver Transplantation” of China’s Second Military University Changzheng Hospital The original page has been removed. Refer to its archive:"
"Prognostic Effects and Treatments of Severe Hepatitis Cases Journal of Clinical Surgery Volume 14, Issue 6, June 2006 Fu Zhiren and Ma Jun"
"China Liver Transplant Registry’s 2006 Annual Report China Liver Transplant Registry"
"Bloody Harvest: Organ Harvesting of Falun Gong Practitioners in China (Revised Edition) Appendix 5. 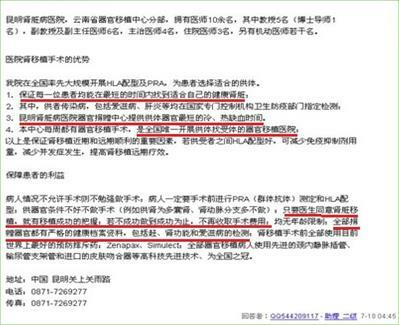 The Recipient Experience January 1, 2007 David Matas, David Kilgour"
"Awarded Physician of Chinese Physician Prize – Tan Jianming Source: Chinese Physician Association Website 2014"
"In China, 98% of Organ Transplant Sources Controlled by Parties Other Than Ministry of Health Life Weekly, Sina.com April 7th , 2006 Guo Na"
"A successful fourth renal transplantation for a uremic patient with a single Kidney The personal website of Dr. Zhu Tongyu doctor"